Sometimes it seems as though terrifying things surround us, both of the natural and supernatural variety. From strange creatures inhabiting the depths of the ocean to mythical beasts, aliens, and ghosts — this post is full of interesting and spooky images. The scariest part? These were all images caught on camera. The image captured by a hospital security camera is truly terrifying. See for yourself coming up! This photo was purportedly taken back in the 1950s in Texas. The story goes that the Cooper family had moved into a new home. Well, new to them anyway as the house itself was apparently quite old. The family decided to document the happy occasion with a photo but got an entirely terrifying surprise when they developed the film. 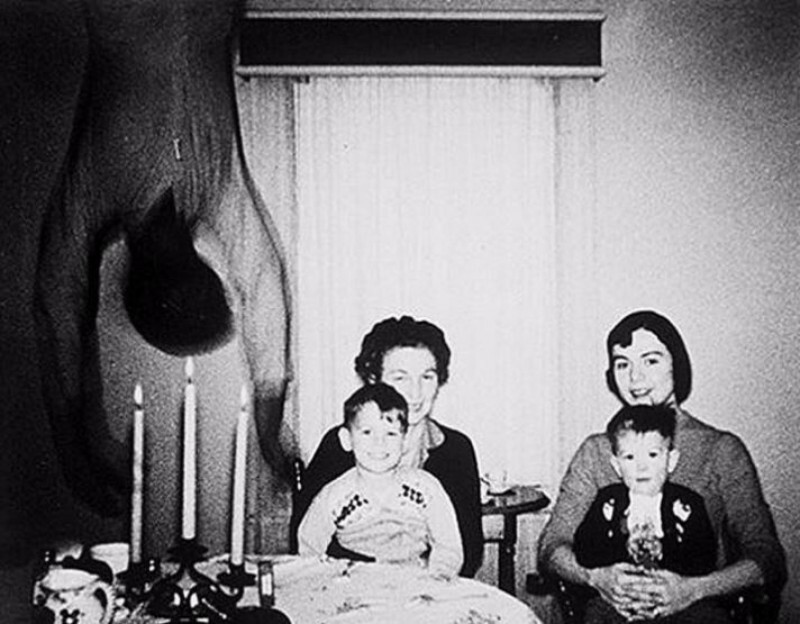 When they received the photograph, it appeared that someone, or something, was hanging from the ceiling. The ghostly figure appeared quite distorted and the family could find no reason for the occurrence. Some have attempted to debunk the photograph however no solid evidence has ever been uncovered to fully disprove or prove its authenticity. In 2010, a very terrifying looking monster was caught on film by a pair of men walking through the swampy terrain of Louisiana. Some locals have speculated that the photo actually shows a Cajun swamp monster called the Rougarou. The mythical beast stems from the French Louisiana people and is similar to the idea of Bigfoot or a Native American Wendigo creature. The creature is said to have a human-like body but with the head of a wolf or dog. Like a werewolf, the creature is also able to turn a human into one of its kind with a bite. 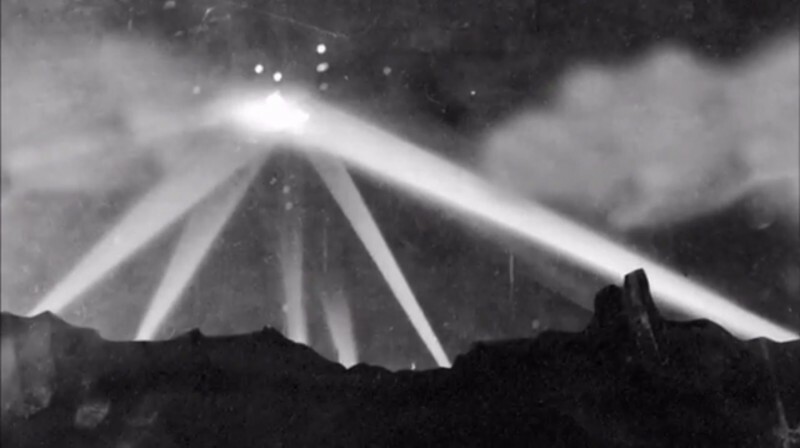 The Battle over Los Angeles refers to what has commonly been theorized to be a fight with UFOs back in the 1940s. Anti-aircraft artillery was fired at something in the sky and this iconic photograph purports to show spotlights pointed at the craft. However, it is also worth noting that this took place only a few months after the horrific bombing of Pearl Harbor. Authorities claimed that event was a “false alarm” due to heightened anxieties because of the impending war. Newspapers at the time were also concerned there might have been some kind of cover-up akin to what people say happened a decade later in Roswell, New Mexico. 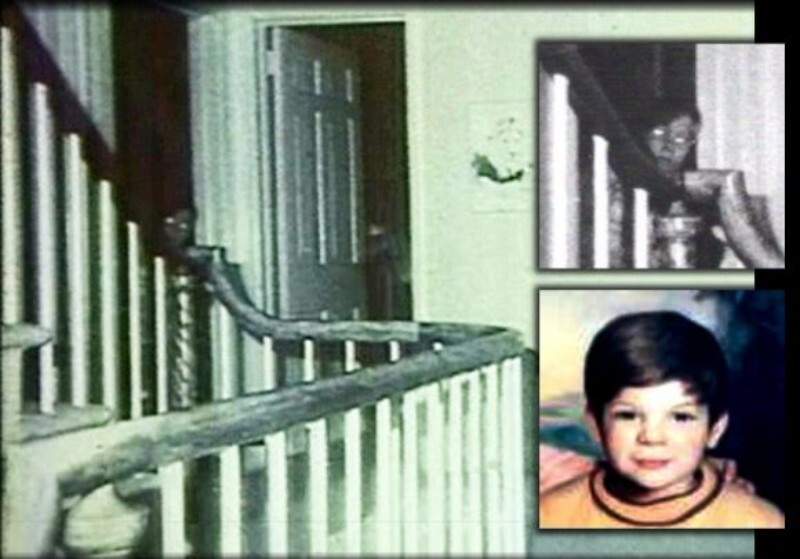 The Amityville Ghost is probably one of the most famous of all time. There was a book written and multiple films made under the now famous name “The Amityville Horror”. The real story behind the haunting is a horrifying familial crime. In the early 1970s, Ronald DeFeo Jr. killed his mother and father and his younger siblings – two brothers and two sisters. He shot them all as they slept. DeFeo claimed that he was prodded into committing the heinous acts by supernatural forces. Later, the home went up for sale and was purchased by the Lutz family. Soon a real-life horror began to unfold. 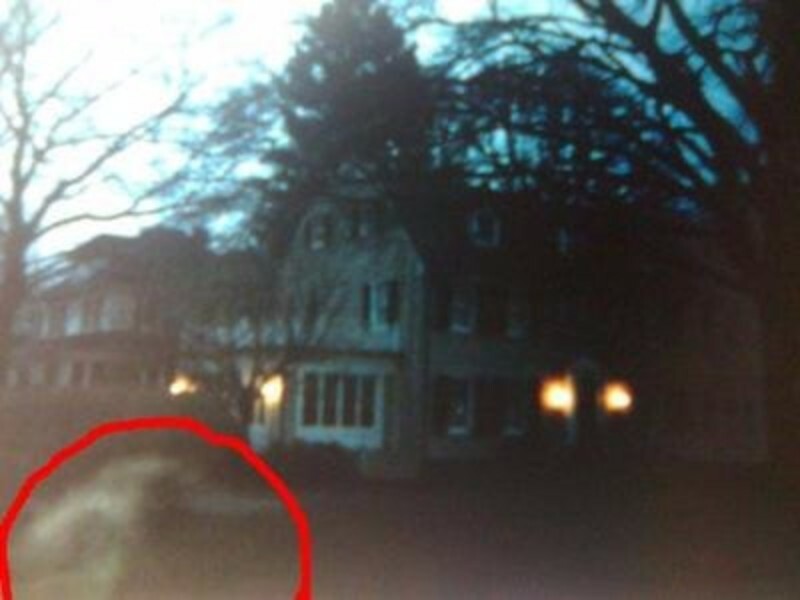 In the above photo, investigators claim a spirit is seen in the lower left-hand corner. Keep reading to learn more about the aftershock of the Amityville house murders. It was then that a real-life horror was uncovered including possession, demons, and green slime oozing from the walls. They only lasted in the home for around a month before they investigators came and the Lutz family moved out. The famous couple Ed and Lorraine Warren were the ones who came to investigate. They brought a professional photographer with them who was said to have snapped this image which shows the image of a ghostly boy peering out of a room. Some have identified the boy as Ron DeFeo’s younger brother John Matthew. Many have since claimed that the entire thing is a hoax, however, the story certainly remains one of the most famous ghost stories of all time! Waverly Hills Sanitarium was located in Kentucky many years ago. In the early 1900s, it was there to help patients who came down with tuberculosis. However, medicine still had a long way to go at the time and doctors engaged in less than desirable practices including experimental treatments. Doctors did not yet have the proper antibiotics at their disposal so they attempted to “cure” patients with fresh air and sun. Obviously, this didn’t work and many patients died. In order to prevent other patients from finding out about the deaths, doctors ordered workers to dispose of the bodies by dumping them in an underground tunnel. As many as 8,000 people were thought to have been disposed of in this way. It’s no surprise that many have claimed there to be multiple hauntings. In this photo, investigators claim it is possible to see the image of a ghost boy. Although the sanitarium was abandoned after the discovery of the proper antibiotic to treat tuberculosis, many believe it remains haunted today. One of the most famous stories is of a nurse named Mary Lee. Mary, unfortunately, contracted the horrifying disease she tried to help treat. At one point, she was found hanging from a light fixture in room 502. Circumstances surrounding her death were disturbing as some say she killed herself while others believe she was killed. The reason? Mary allegedly found out that she was pregnant by one of the doctors but was unmarried, which was unacceptable at the time. Her body was left hanging for days before she was discovered. This photo is alleged to show poor Mary Lee, forever stuck in the halls of Waverly Hills. 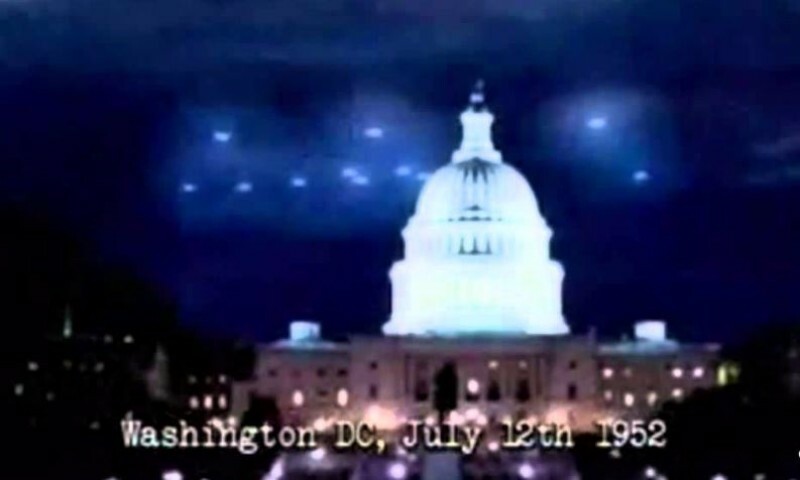 In 1952 multiple accounts surfaced of unidentified flying objects over Washington, D.C. Curtis Peeble, a UFO historian, said that “Never before or after did Project Blue Book and the Air Force undergo such a tidal wave of [UFO] reports.” Project Blue Book was an Air Force study that focused on UFO’s and whether they were a threat to the United States. It took place from 1952 until 1970. On this particular night, multiple witnesses saw groups of craft flying what looked to be over the White House. The craft were first noticed on radar by an air traffic controller, and the craft was unidentified. These sightings made front page news around the nation. 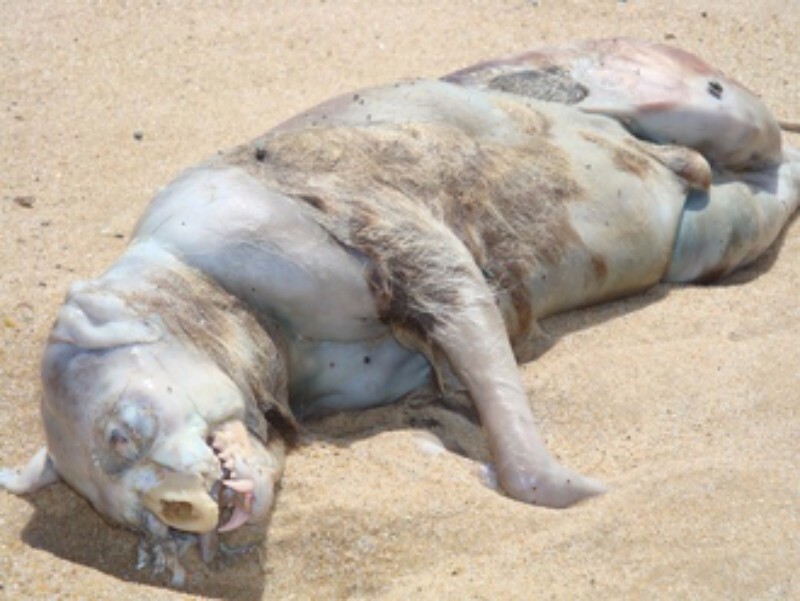 In 2008, a strange, unidentifiable creature washed ashore on Montauk Beach. It originally appeared in The Independent Newspaper, where one of the women who found the beast speculated it may have come from Plum Island. Plum Island is a nearby Animal Disease Center which has been bereft with rumors since the days of the Cold War when there was apparently testing done on animals at the site with biological weapons. In 2003, a whistleblower came forward who said the site engaged in unsafe practices. He voiced his concerns to aides for Hillary Clinton and wrote a letter to the Department of Homeland Security. Author Michael C. Carroll wrote in Lab 257 that there is a direct connection between Plum Island and various disease outbreaks including the West Nile virus in 1999, Lyme disease in 1975, and Dutch duck plague in 1967. Others have speculated that it is merely the decomposing carcass of a raccoon, but well, you be the judge! The image captured here looks to be straight out of a horror film. This photo was allegedly taken as a still from surveillance camera footage. The origin is unknown as of now. It is said that a nurse is the individual who snapped the image. The figure seen here seems even more insidious than your everyday ghost and appears almost demonic in nature. 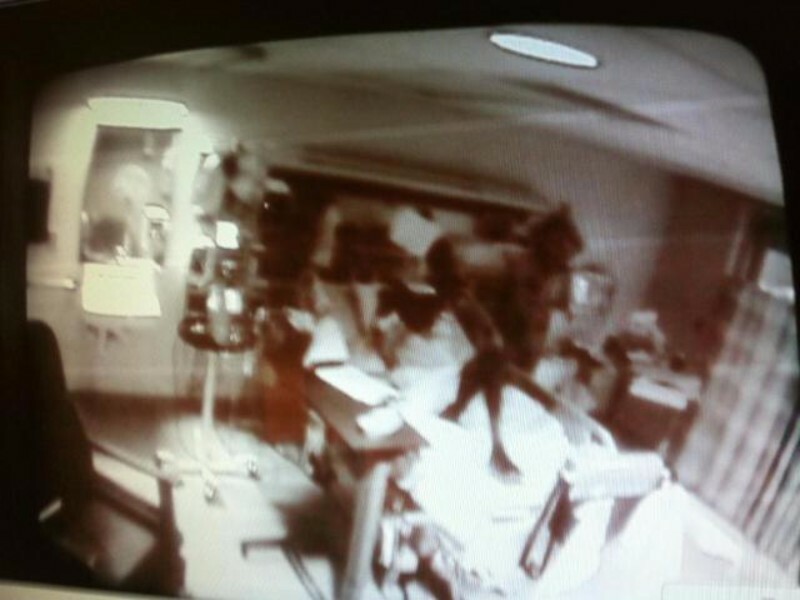 The figure looks to be crouching over a patient who is lying in a hospital bed. Allegedly, the accompanying film also shows the figure walking on top of the patient’s body. After the figure made itself known, the patient passed away some hours later. According to many healthcare professionals, ghostly apparitions are not uncommon in a hospital setting. In 2009, an extremely strange phenomenon appeared in the Norwegian night sky. The phenomenon was a spiral that seemed to be moving. It was able to be seen quite vividly from both Norway and Sweden. 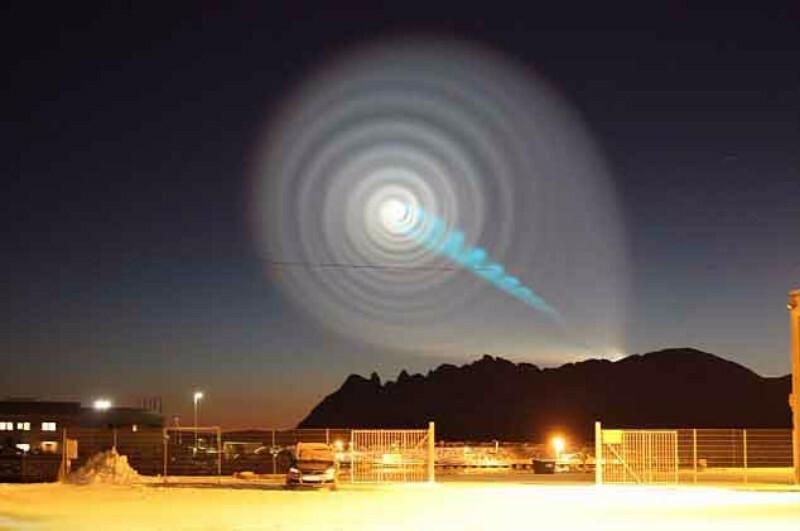 There was a bright blue beam of light with a faded white colored spiral coming from one end of it. The spiral appeared to be moving which was photographed and filmed in awesome quality. Rumors abounded throughout the world over what the spiral could possibly be. Everything from a wormhole opening up to a black hole opening caused by the CERN large Hadron collider which is located on the border of France and Switzerland. Officials claimed it appeared to be related to Russians testing a missile and Russia did confirm that some kind of test occurred on the date of the anomaly although did not take responsibility for the event. Whatever the truth might be, the outcome was truly a strange sight to behold. Who could forget the lovable dog-dragon Falkor from the classic film The Neverending Story? Could it be that the imaginary creature actually exists? 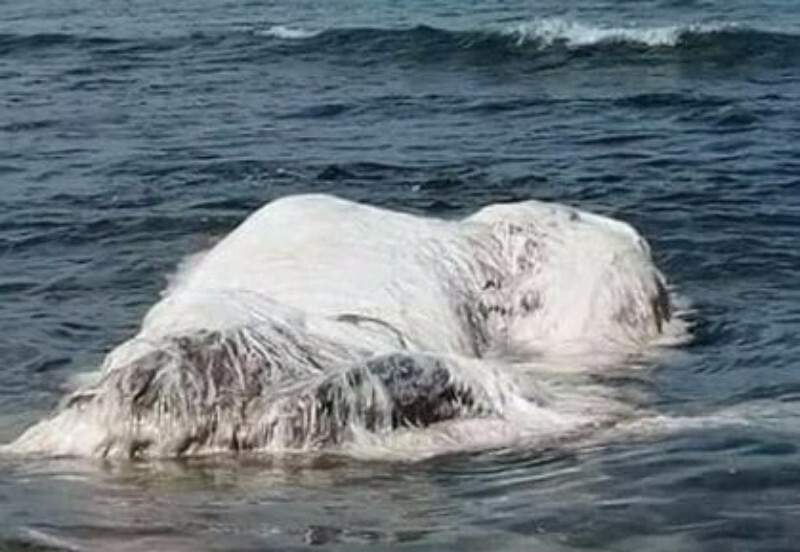 In February 2017, a massive white creature washed up on the beach in the Philippines. While beached whales are not uncommon, there was something strikingly different about this particular creature – it was covered with white fluffy hair! While people from the area thought perhaps the strange creature was killed and forced to the surface during a recent earthquake, researchers believe that to be unlikely. Rather, researchers believe it is likely it was killed after being hit by a ship. Although speculation continues, the official word from authorities at the Bureau of Fisheries and Aquatic Resources have said that the creature was a whale although they do not know what kind. Who knew that decomposing could cause an animal to grow hair?! 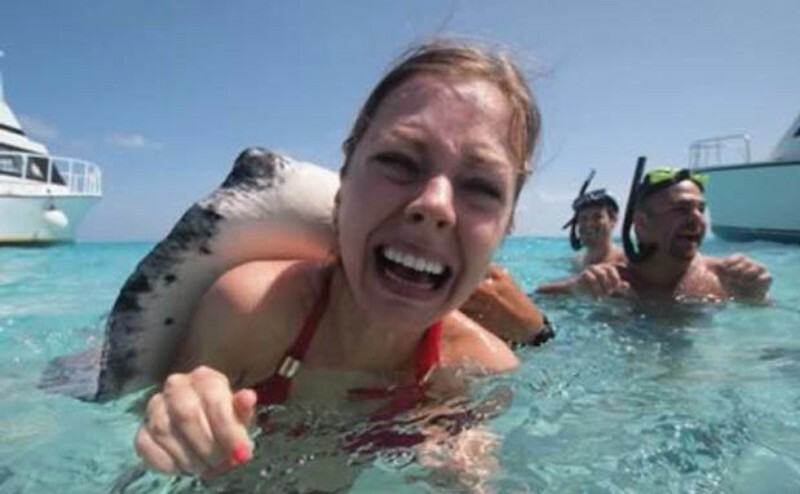 The girl pictured here is getting a lovely hug from a sting ray. While the creature is rather docile and not known to actively seek out hurting humans, there are still absolutely risks with getting so close to the animal. For instance, how could we forget that this creature was the cause of death of beloved Australian animal expert Steve Irwin? In 2006, while filming for a show called “The Ocean’s Deadliest”, Steve was snorkeling in shallow water when he came across a massive sting ray measuring eight feet wide. The creature likely thought Steve’s shadow was a shark and began striking wildly with its sharp tail barb striking him in the heart, causing his untimely death. In 2005, an amazingly powerful hurricane hit the United States with its full force on the gulf coast. 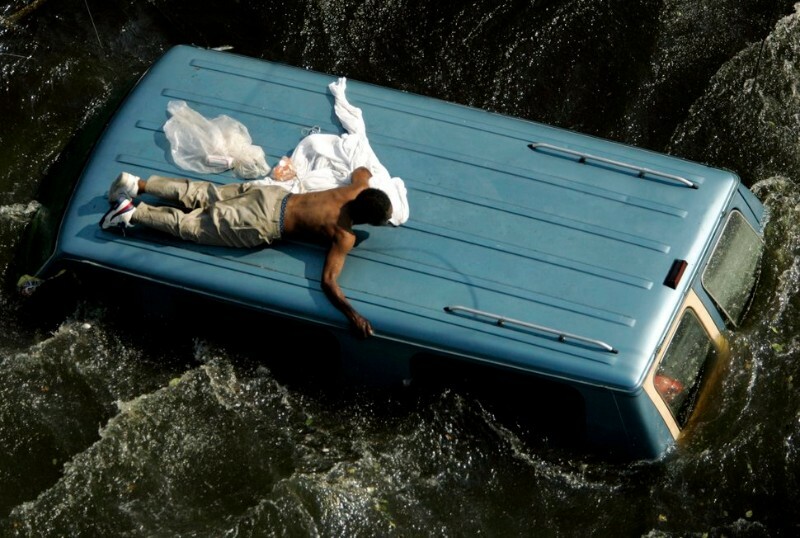 The effects of the storm were horrifying and at least 1,245 people perished in the subsequent flooding. The government was also criticized for its lackluster response and aid given to the people in the affected areas. Some people were permanently displaced and lost everything in the storm which still affects many today. The images that were distributed from the disaster stunned the rest of the country. New Orleans, in particular, was strongly impacted by over 80% of its parishes flooding. While some services did attempt to warn people, and encouraged them to evacuate the area before the storm hit, many people decided to stay and weather the storm. For some unfortunate souls, this resulted in their untimely demise. 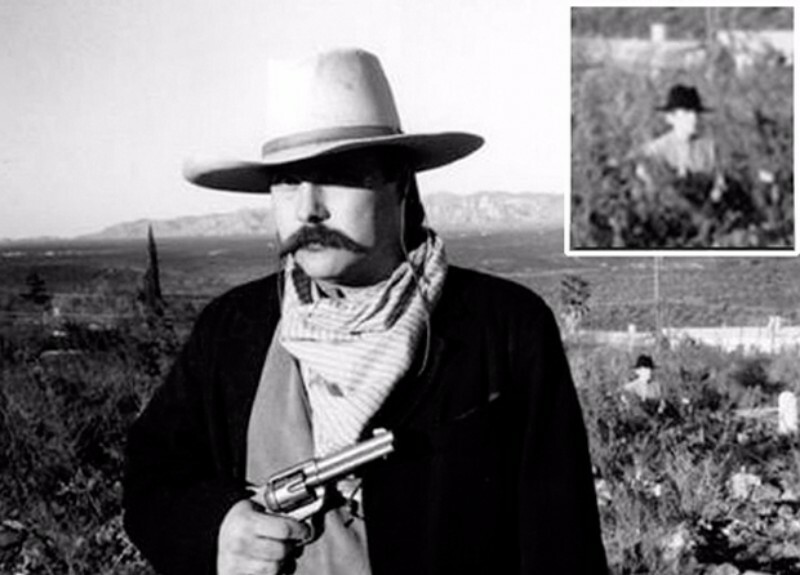 After the movie Tombstone came out, there was a renewed interest in the famous gun battle, the characters, and the area in which the film took place. Many fans clamored to Boothill Graveyard in Tombstone Arizona to take photographs in the area. One man named Ike Clanton even decked himself out in cowboy attire to get a good shot. However, it seems like perhaps his attire was a little too authentic and attracted some lingering cowboy spirits in the area. After he developed his film he saw a strange disembodied figure in the background that appeared to be wearing a cowboy hat. At the time of actually snapping the photo there was no one else around. Ike later even attempted to recreate the photo and had someone stand in the same spot as the mysterious cowboy in the background. He soon realized that it was not humanly possible to take a shot without seeing the person’s legs, unlike the mysterious cowboy figure. While Ike was previously dubious, at best, about the existence of ghosts in the area, he was definitely sure of his belief after the spooky encounter. Sadly, this photograph is most certainly authentic. 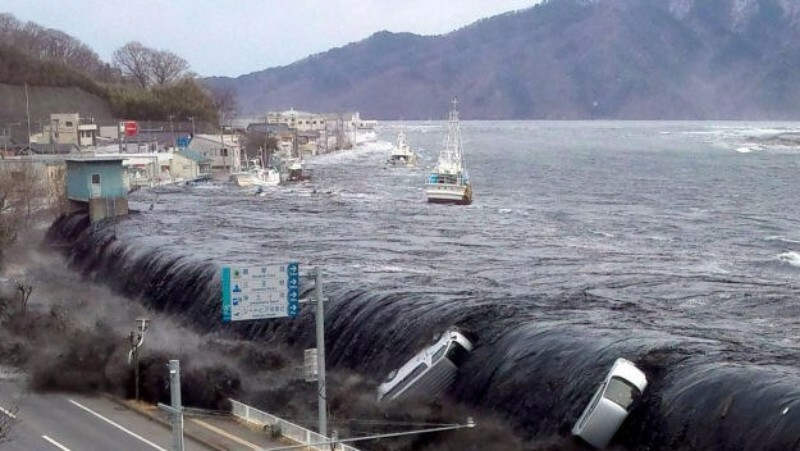 The 2011 Tōhoku earthquake, and subsequent tsunami, was a horrifying natural disaster that took place in Japan. There were reportedly some 15,894 people killed, with over 6,000 missing people. Hundreds of thousands were displaced by the horrifying storm. The effects of the storm were widespread and also caused a nuclear disaster dubbed the Fukushima Nuclear Disaster when the cooling system at the Fukushima nuclear plant failed. The radiation levels were over 1,000 times the normal levels within the plant and elevated in the surrounding area as well. People in the area were subsequently evacuated and scientist have said the problem will have long-ranging effects on the environment and life of the area. A UFO phenomenon known as the “Phoenix Lights” occurred in Phoenix, Arizona in 1997. A mass amount of people witnessed some kind of UFO in the sky on March 13th of that year. Witnesses described seeing two different phenomena. 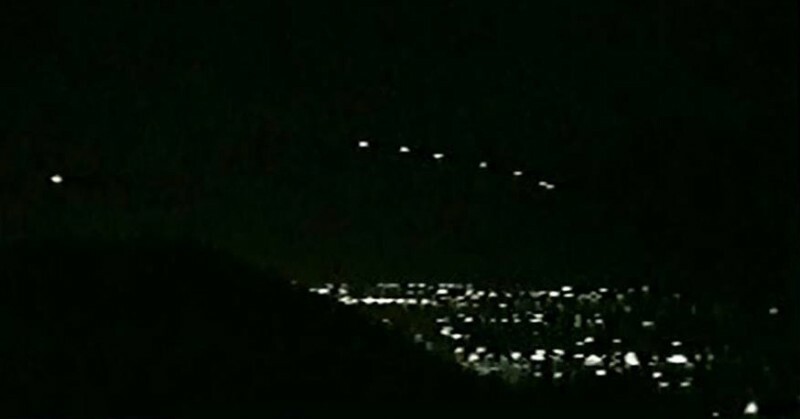 First, a triangular formation of lights and secondly, another series of lights that remained stationary over Phoenix. Even the governor at the time, Fife Symington, witnessed the UFO. The sight apparently lasted for several hours and many people took photos of the event. While the Air Force said they believe the second occurrence of lights was attributed to “flares”, they offered no such explanation of the first. Similar lights appeared in both 2007 and 2008. To this day, the origin of the lights remains unknown and locals in the area remain convinced of their otherworldly origins. In 2013, lightning struck Yarnell Hill Arizona starting a massive fire on Bureau of Land Management property. The conditions at the time, including a drought and strong winds, were the perfect storm to create a powerful and fast spreading fire. In areas like this there are even specialized firefighters who swoop in to combat the flames. 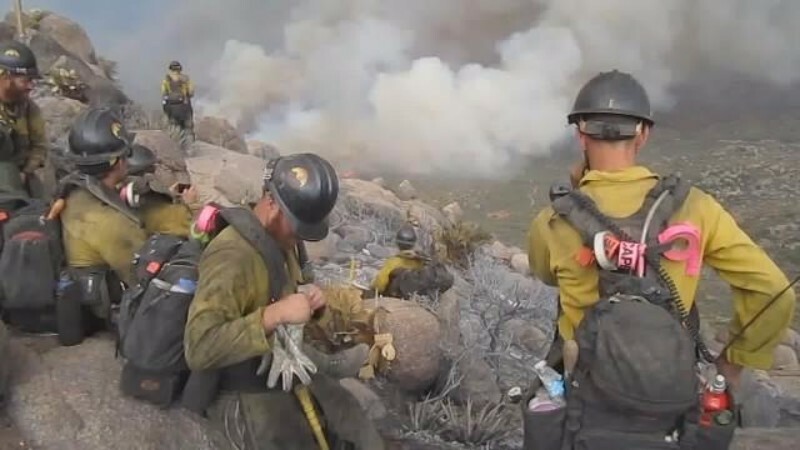 In the Yarnell Hill fire, members of the Granite Mountain Hotshots fought the wildfires. 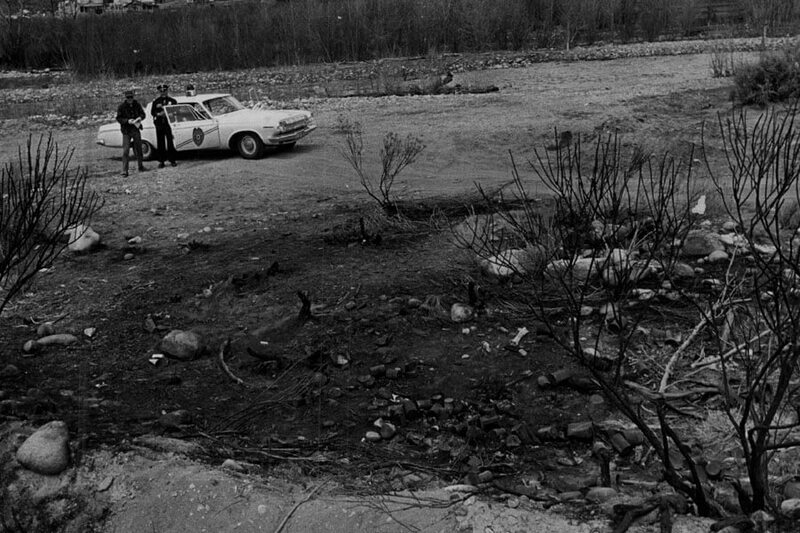 Unfortunately, the fire overran and killed nineteen of the Granite Mountain Hotshots. The loss was tremendous to the community and to the United States. Even Vice President Joe Biden went to a memorial service for the men and said, “All men are created equal, and some become firefighters”. 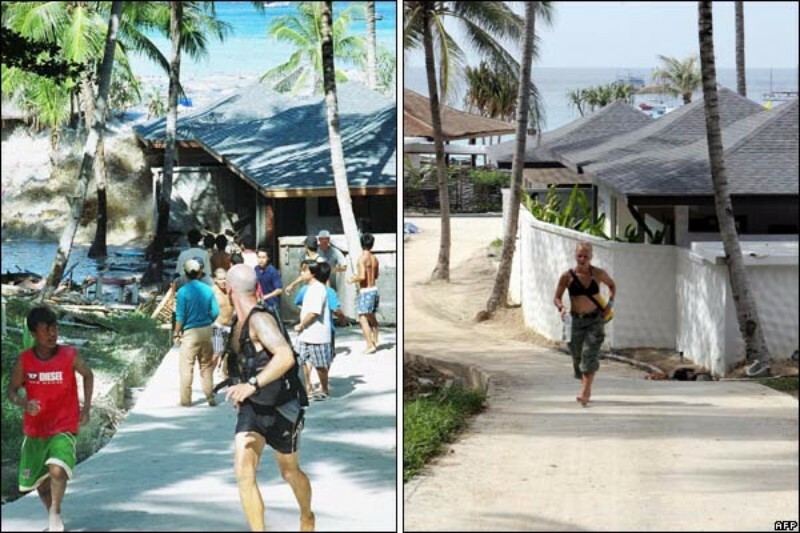 In 2004, the Indian Ocean was hit with a massive earthquake which spurned a huge tsunami causing massive amounts of damage and loss of life in multiple countries. Between 230,000 and 280,000 people were killed in the utter devastation. The earthquake itself was the third largest ever to be recorded on a seismograph, it caused the tectonic plates to shift which in turned caused the ocean to basically go haywire. It is one of the deadliest natural disasters to ever occur. These images are absolutely terrifying because people had to have seen what was coming but were unable to do anything other than accept their fate at the hand of the all-powerful oceans. The tornado that hit Joplin, Missouri in 2011 was truly the stuff of nightmares. The tornado was an EF5 which means it was as bad as it gets. The tornado was one of the deadliest ever to hit the United States, and 158 people were killed as a result of its terrifying power. It was also one of the costliest disasters ever and caused $2.8 billion in damage. 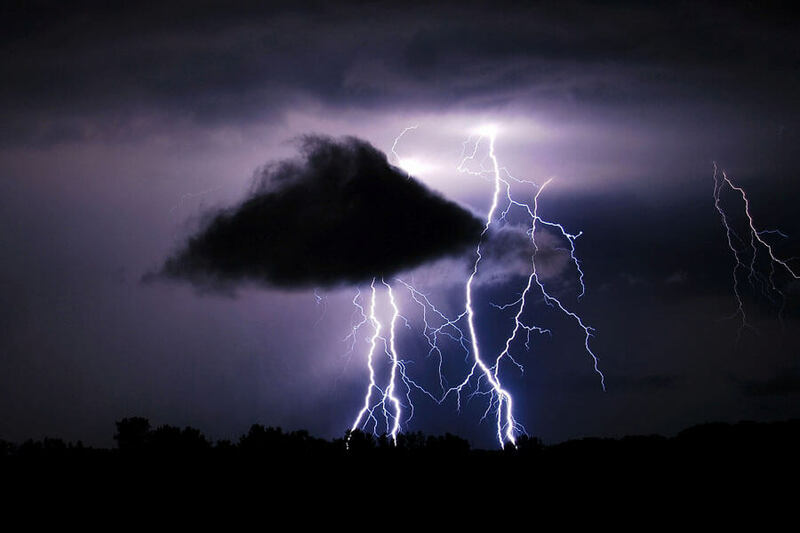 While tornado prediction sciences and other weather reading tools have advanced quite far in this day and age, this storm was quite striking because its sheer strength was able to cause so much damage and loss of human life even with forewarning. Since being taken in 1923, this ghastly photo has been exposed as a hoax. That doesn’t mean it’s not frightening, though! The man in the picture was instructed at a seance to pose. 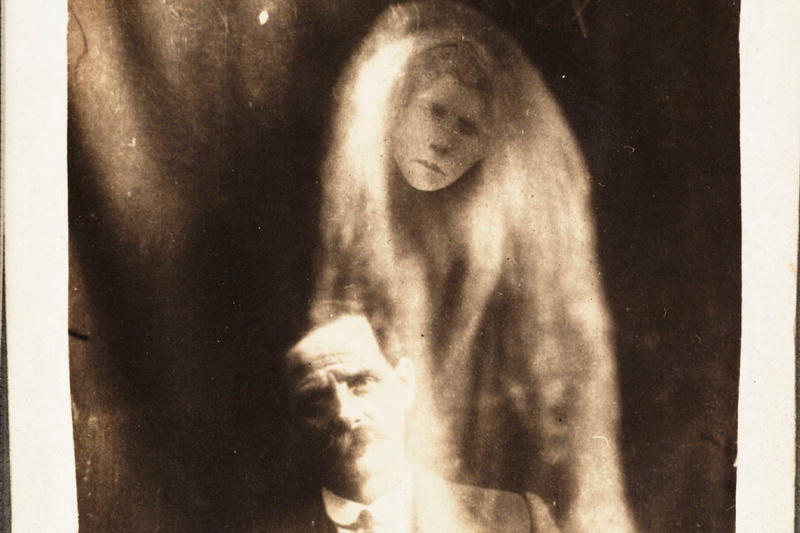 William Hope took the photo, using multiple exposures to create the appearance of ghostly figures. After World War I, Hope turned his hoax into a profitable business, taking pictures of the bereaved who hoped to see their loved ones again. Looks Like A UFO To Us! There is no denying that’s an unidentified flying object in this photo. The still was captured in 1950 over a farm in Minnville, Oregon. Paul Trent took credit for the picture and no one has come up with an earthly explanation for it yet. 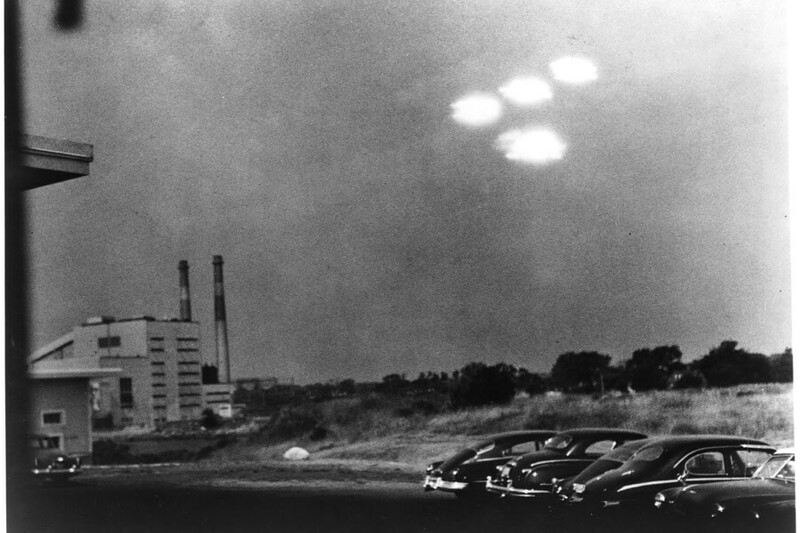 Our best guess is that aliens couldn’t resist visiting our planet in the 1940s and 1950s. It’s a pretty sweet spot in the solar system to take a break and stretch your tentacles! If there’s one thing horror movies have taught us it’s this; never going into the misty woods alone. Or at all, for that matter! Who knows what werewolves are lurking just beyond the fog. Maybe the fog was created by witches hoping to lure curious victims to their doom. 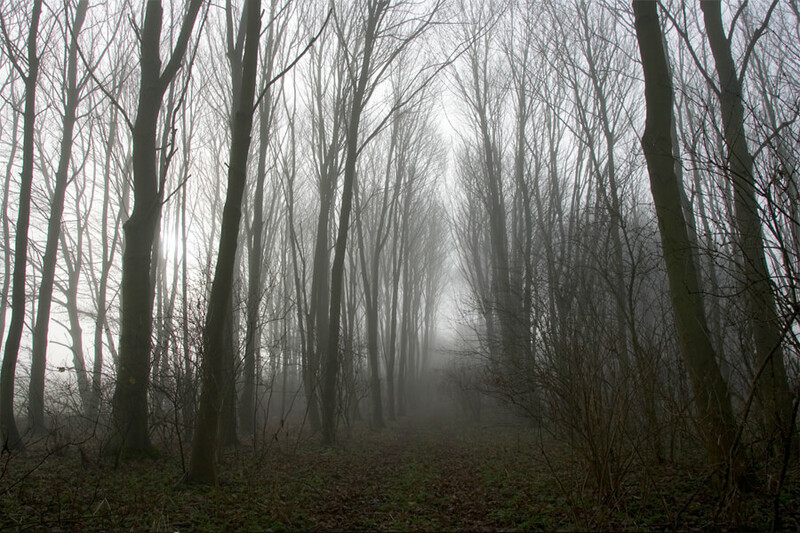 Whatever the scenario, this creepy shot was taken in January 2006 in Gloucestershire, United Kingdom. What a mouthful! 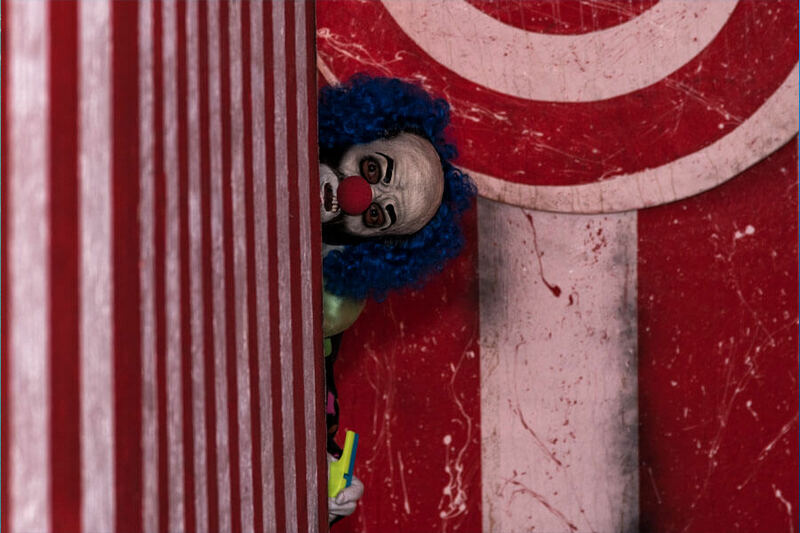 If you weren’t scared of clowns before seeing this picture we apologize. A mix of the Joker and It, this creepy fellow has no interest in making you smile. Don’t worry, though, you’ll only run into this nightmare around Halloween in Northern Ireland. 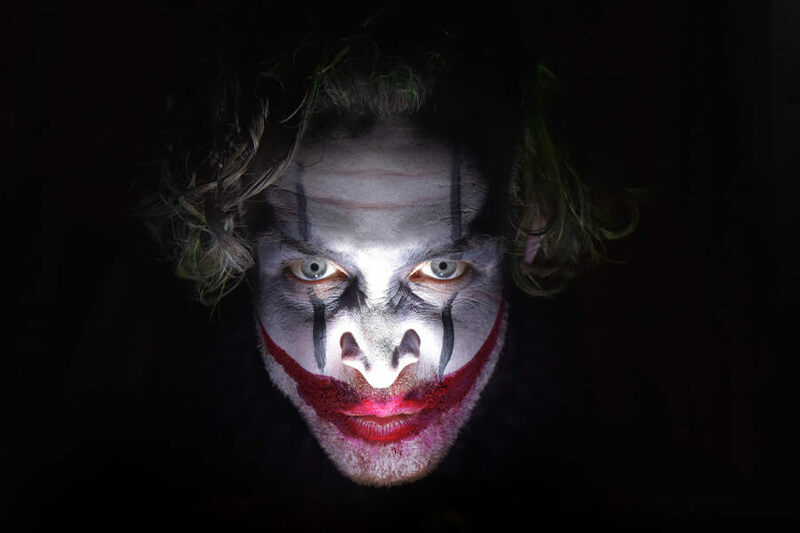 He’s a cast member in makeup for A Chateau Le Fear, part of an interactive house of horrors show put on every Halloween. Another day, another unexplainable picture of UFOs. Maybe it’s time to admit aliens exist, and they love Earth. This photo was taken in 1952 in the morning over a parking lot. It’s unclear what the four lights are, but they sure look like brightly lit flying saucers. Like the picture before form 1950, no earthly explanation has been given for the existence of this photo. Hopefully, they came in peace! 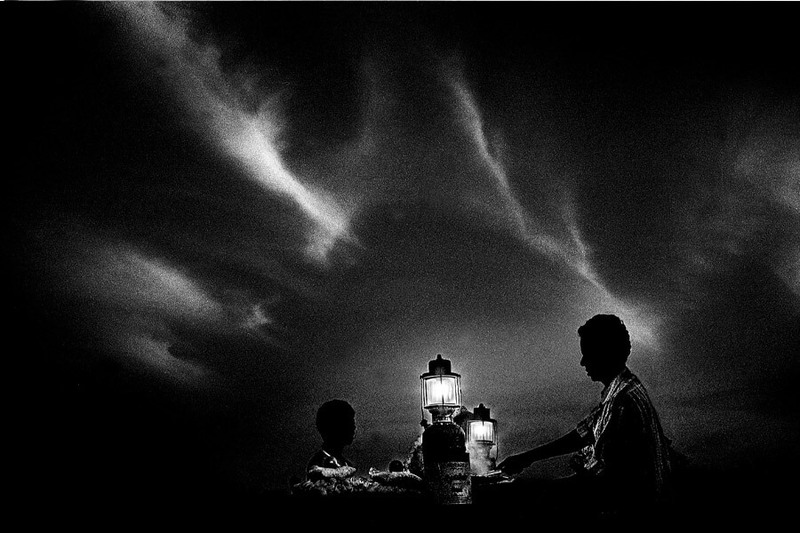 This frightening photo that looks like a late night seance is actually a father and son setting up a food stall. Taken in India in 2003, this pair spends their nights selling chickpeas and curry to passing vendors. The long stretch of the beach these two occupy becomes a fairground at night. This picture is all bark and no bite, but that’s okay. Not every book can be judged by its cover! 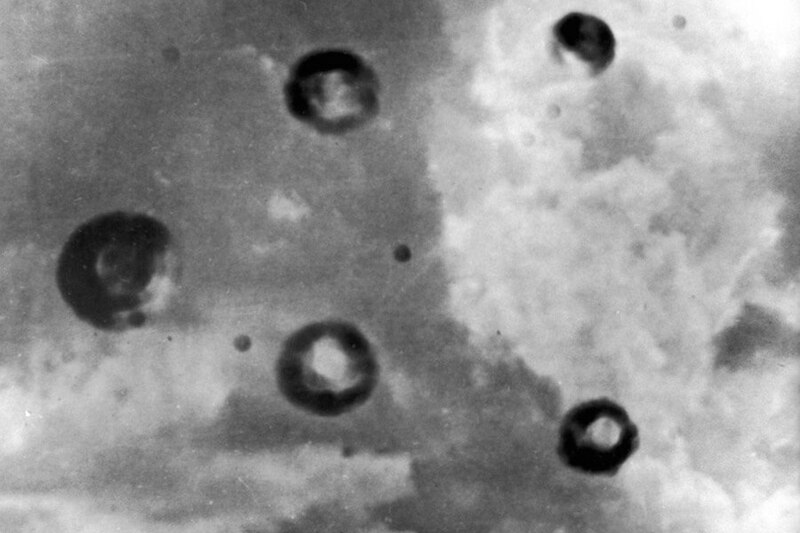 Taken in Ireland, this photo is reportedly the first recorded of unidentified flying objects. 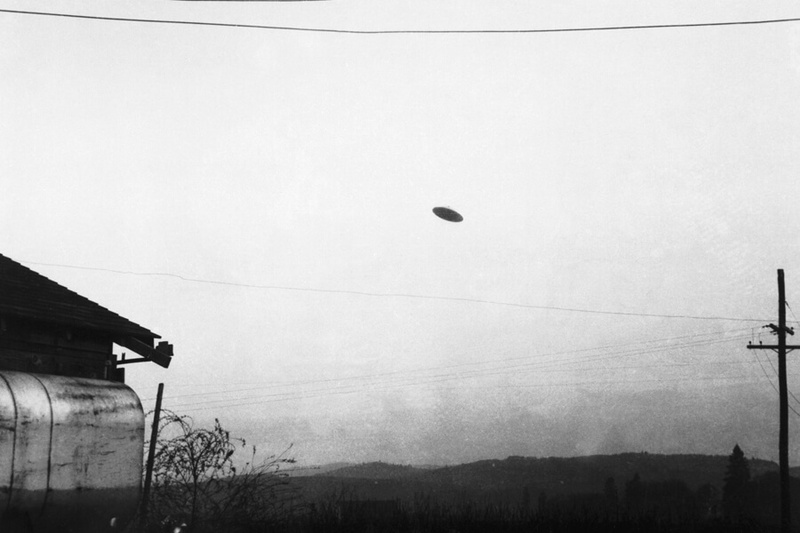 The article this picture comes from claims that flying saucers are the houses of A and H bombs. The bombs could be held in a suspended state above any point on Earth. Once the UFO reached its target, the piece claims, the bomb could be dropped accurately on its target. This image from 2013 was taken during a real exorcism in Columbia. 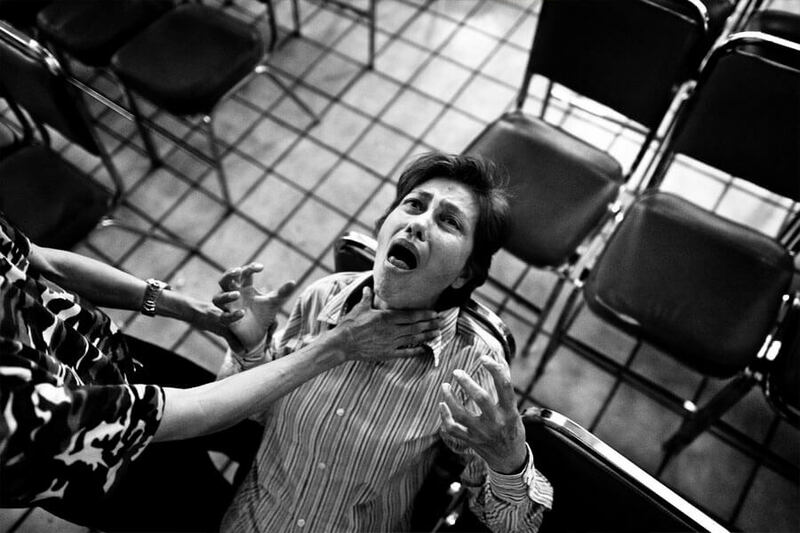 Exorcisms are a regular practice in Bogota, Columbia. Believers numbering in the hundreds gather weekly to perform the spirit cleansing ritual. If you want to see an exorcism for yourself, good luck finding them. The religious followers meet in unmarked churches to save lost souls. Participating in a festival known as “La Fiesta de los Diablos y Mascaritas,” these Spanish demons take their inspiration from Celtic times. Celebrated across Spain, the festival that dates back to the Celts is one of the least known in the world. We think we know why, too! Look at those horns and faces! 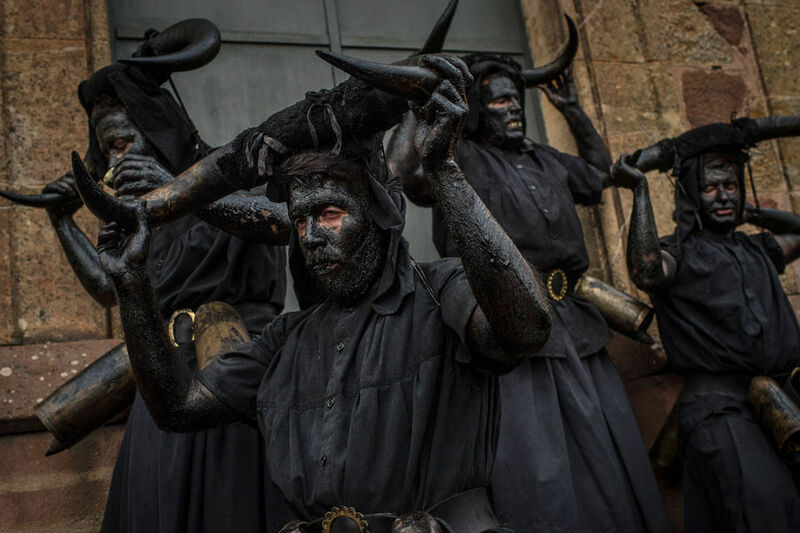 Covering their bodies in oil and soot, these Spanish festivalgoers carry horns to represent demons. Thankfully no real demons have ever been reported at the event. Well, this doesn’t seem very safe! 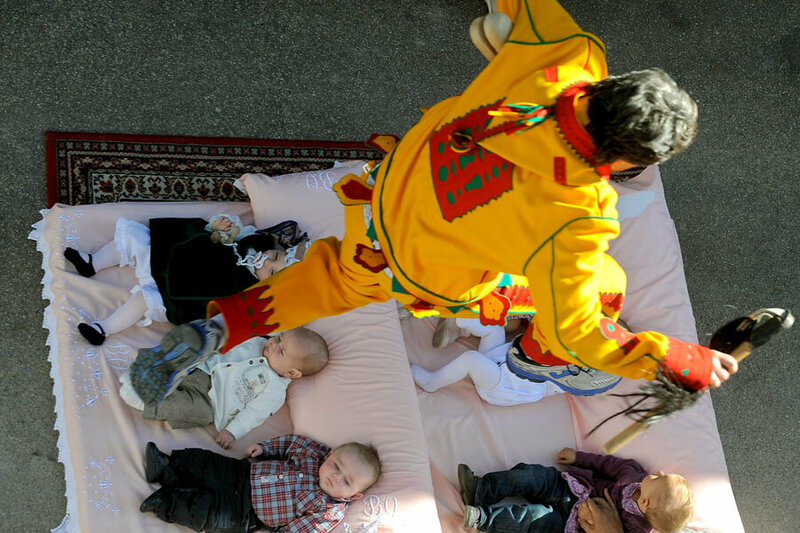 This scary activity happens every year in Spain during the El Colacho festival. The babies are laid in the bed and a man representing the Devil leaps over them. In doing this he taking away their original sin. The festival takes place on the first Sunday after Corpus Christi. We promise no babies were harmed in the taking of this photo. This exorcism took place in Mexico in 2011. The woman screamed intensely as the “exorcista” worked to expel the demon from inside. Whether you believe in demon possession or not, photos like this are frightening for the conviction these sufferers have. This photo is undoctored and the fear in this woman’s eyes are very genuine! This exorcism was not a traditional one, either. Traditional exorcisms are performed rarely, and only by designated priests. Proof that working in the dump is never safe, the man does not have an easy trip taking the trash out. 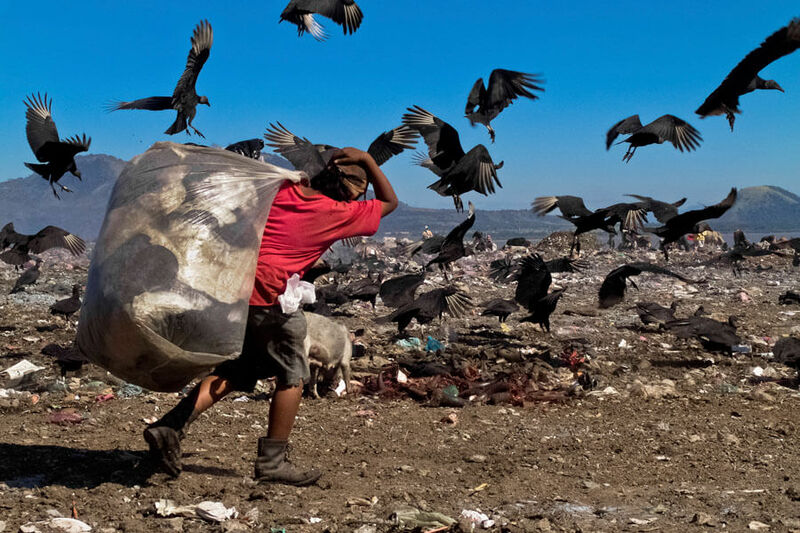 This particular dumping ground is located on the shores of Lake Xolotlan. The contaminated region has become toxic with trash. Who knows what diseases these birds might be carrying. He probably should have worn longer pants! Many people who live in this area believe it is the end of the world. That’s A Lot Of Teeth! This frill shark is all thrills and no spills! There’s no way you’d hang around the beach for very long if you saw that mouth smiling back at you! This particular specimen was captured on film in 2007 off the coast of Japan. Fear not, however, this shark is normally a deep sea dweller, living at depths of 600 meters. 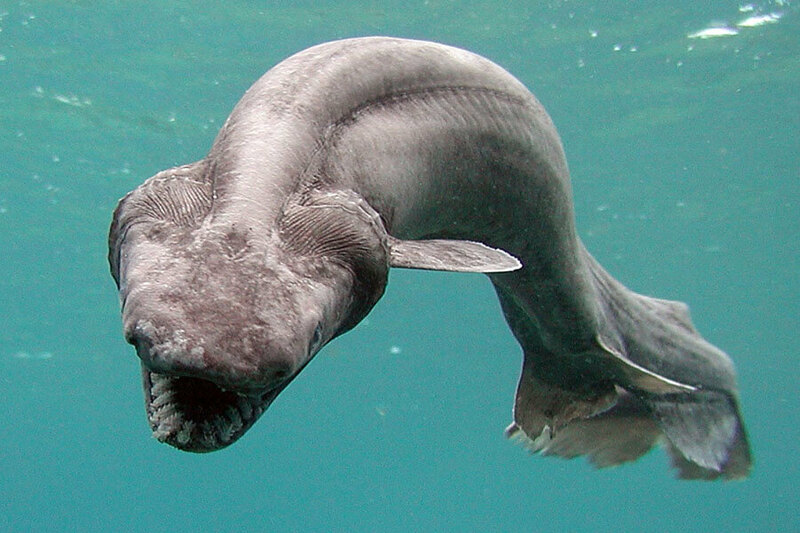 Sightings of the frill shark are so rare, in fact, that scientists theorize it to be the creature behind the myths of many ocean monsters. People who swim with sharks are crazy. This photographer must know that 12-foot beat could take a chunk out of him at any second. The scariest part is this thrill seeker named Fernando, does this for his job. 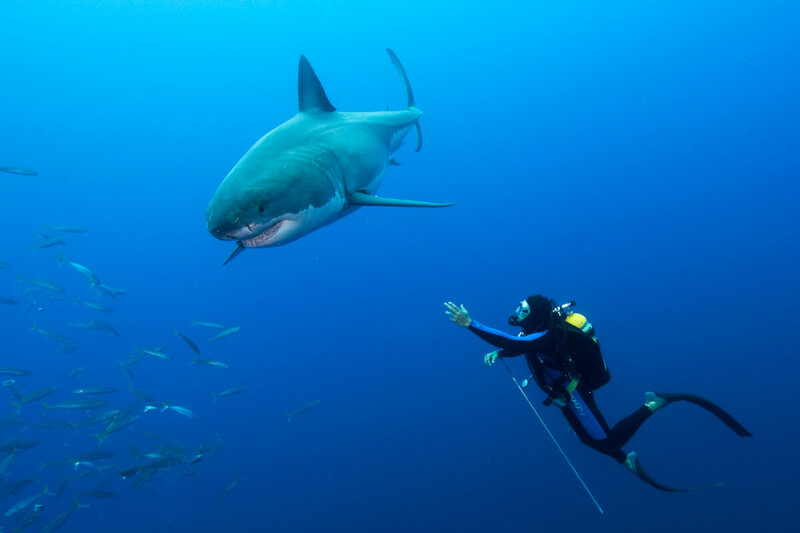 Along with Amos’ Big Animals World Class Photography expeditions, Fernando takes groups of up to six divers at a time into the deep blue with these great white sharks. This clown lives in Long Beach, California and he just wants friends. There’s nothing dangerous waiting for you around the corner. If you’re a fan of being scared, then this haunted maze trip is just for you! The three-day experience takes place in Long Beach every year and includes a brain-eating contest, zombie dance contest, costume contest, and other devilishly delightful nightmares. 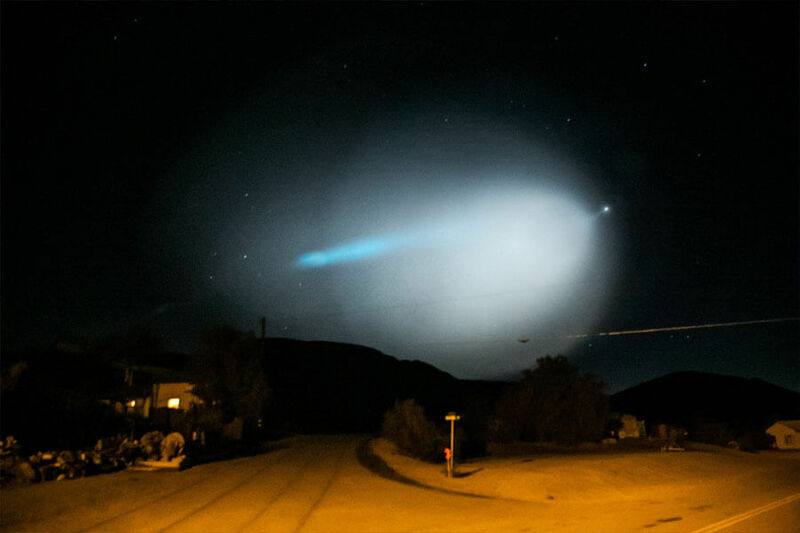 This streaking light appeared over Los Angeles is 2015, scaring everyone into thinking aliens had invaded. According to the government, however, it was just a missile test. We’ve never seen a missile trailed by bright blue light, though! The public might not believe it, but the military claims that it was a routine missile test over the ocean. Their story totally checks out. Taken in 1964, this photo shows a circle of burned earth 32-by-49 feet large. Although no picture was taken at the time of the burning, a witness at the location claimes he saw a strange object spouting flames. And what state did this scary scene happen in? New Mexico, of course! If aliens turn out to exist one day, we have to ask them what their obsession with New Mexico is! This photo was taken in Missouri, not New Mexico, so we feel pretty confident saying it’s a cloud and not a UFO. The resemblance is uncanny, though! Shane Kirk is responsible for the photo. While most of his friends in the Midwest are out chasing tornados, he loves chasing lighting. Both seem pretty deadly, but if it’s what makes Kirk happy then we’re happy for him! If this tree is trying to make friends it’s doing a terrible job. 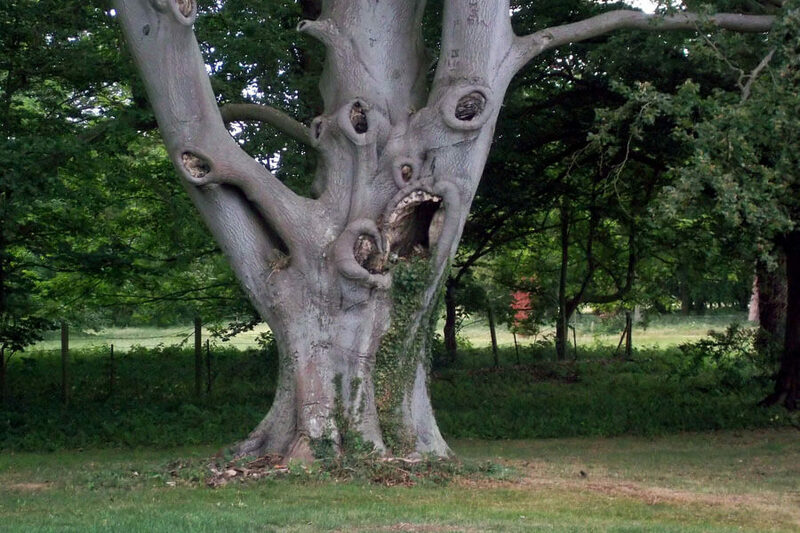 Located in Suffolk, the tree looks like a demon straight out of our nightmares. With at least four eyes straight through us and mouth full of tree teeth, the willow does not want to be climbed. Think we’re kidding? This tree has been named as one of the scariest in England. 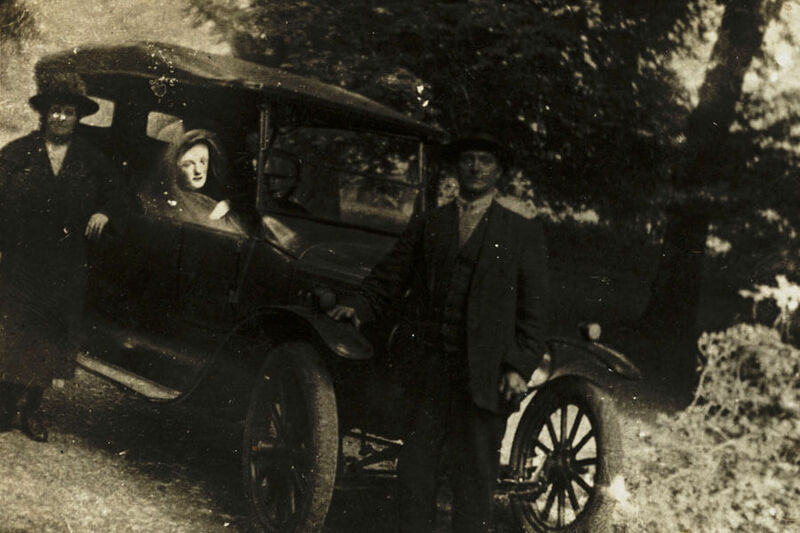 Taken in 1920, this photo shows a couple posing next to their car. The ghostly apparition in the driver’s seat is their dead son. The photo was taken by none other than William Hope. He suggested the couple take the picture in case a spirit impression showed up. Because he was revealed as a con man two years later, the couple was not disappointed. We do wonder if they asked for their money back.